Unenhanced magnetic resonance imaging (MRI) of the lumbosacral spine was performed on a 1.5-Tesla MRI scanner. The study demonstrated an anterior epidural structure posterior to L5 and inferior to the L4-5 disc space. The lesion was not evident on axial images. The finding demonstrated an intermediate signal on T1-weighted images (Figure 1) and a bright signal on T2-weighted images (Figure 2). 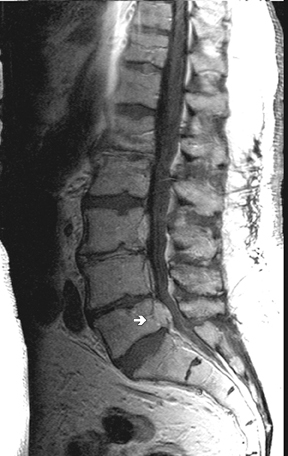 The differential diagnosis was reported as sequestered disc fragment or prominent epidural venous structure. 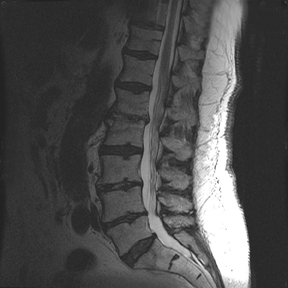 The patient returned for an enhanced exam with thin sections through the L4-L5 disc space. This second exam demonstrated intense enhancement of the lesion (Figure 3). The differential diagnosis at that time included prominent epidural venous structure. Given the patient’s history of multiple myeloma, extramedullary hematopoiesis was also considered. The patient subsequently underwent an L4-L5 hemilaminectomy. At surgery, a distended venous varix extending into the left neural foramen was identified. The varix was electrocoagulated and resected. His postoperative course was complicated by a mild myocardial infarction. However, he had complete resolution of the leg pain with only some mild back pain. A follow-up MRI showed resolution of the lesion (Figure 4). He has had no recurrence of the symptoms at 1 year. The lumbar vertebral venous plexus consists of a retrovertebral plexus framed by paired anterior internal vertebral veins. These vessels are oriented craniocaudally and connected to the ascending lumbar veins, which are located laterally on the vertebral bodies, via the supra- and infrapedicular veins. The lumbar plexus veins course close to the neural foramina and exiting nerve roots. The lumbar segmental veins connect the ascending lumbar veins to the inferior vena cava. This system of veins is valveless, thereby permitting retrograde flow and vascular dilation. The abnormal flow and dilation may occur in cases of caval compression, which may be seen with increased abdominal pressure.5 This has been postulated as an etiologic factor in the development of epidural varices. Venous dilation is also associated with a history of trauma and concurrent herniated disc. Hanley et al. reported a series of 10 patients with epidural varices over 2 years. Six patients had symptoms preceded by dynamic activity, such as twisting, bending, or lifting.5 In Zimmerman’s report of 4 cases, 1 followed strenuous swimming and a second followed a fall. These cases were also significant for simultaneous presence of a herniated disc in the same location. Zimmerman thus advanced the hypothesis that the development of the varix may be secondary to compression of vertebral veins by the adjacent disc, thereby leading to dilation and thrombosis.3 In our case, no predisposing factors could be identified. Overall, the development of the varix is likely multifactorial, and further research is required to fully delineate the etiologic mechanisms. Treatment often consists of surgery with coagulation and resection. Postoperatively, patients often report relief of symptoms. We are not aware of any reports of recurrence of this entity following surgery. We have presented a case of symptomatic epidural varix. This entity is extremely rare, and a radiologist will likely encounter only a handful of such cases in his or her career. However, the diagnosis should be suggested in the proper clinical setting when an epidural lesion brightens on T2 images and enhances with contrast. Cohen I. Extradural varix simulating herniated nucleus pulposus. J Mt Sinai Hosp. 1941;8:136-138. Gumbel U, Pia HW, Vogelsang H. Lumbosacrale Gefassanomalien als Ursache von Ischialgien. Acta Neurochir. 1969;20:131-151. Zimmerman GA, Weingarten K, Lavyne MH. Symptomatic lumbar epidural varices. Report of 2 cases. J Neurosurg. 1994;80:914-918. Zarski S, Styczynski T. Zylakowatosc dolnego odcinka kanalu kregowego. Neurol Neurochir Pol. 1978;12;67-72. Hanley EN Jr, Howard BH, Brigham CD, et al. Lumbar epidural varix as a cause of radiculopathy. Spine. 1994;19:2122-2126. Epstein BS. Low back pain associated with varices of the epidural veins simulating herniation of the nucleus pulposus. Am J Roentgenol Radium Ther. 1947;57:736-740. Pekindil G, Yalniz E. Symptomatic lumbar foramina epidural varix. Case report and review of the literature. Br J Neurosurg. 1997;11:159-160. Wong CH, Thng PL, Thoo FL, et al. 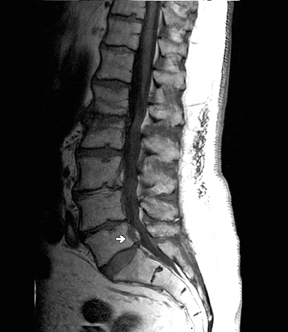 Symptomatic spinal epidural varices presenting with nerve impingement. Spine. 2003;28:E347-E350. Demaerel P, Petre C, Wilms G, et al. 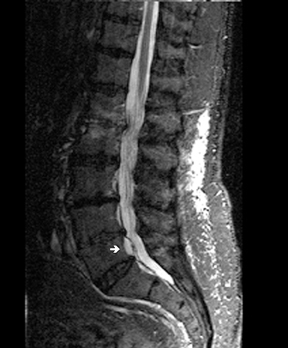 Sciatica caused by a dilated epidural vein: MR findings. Eur Radiol. 1999;9:113-114. Distended epidural varix. Appl Radiol.